On October 12, 2013, Russia’s Minister of Education and Science issued Order No. 1061 “On Approval of the List of Chief Subjects and Areas in Higher Education Training”. On October 14, 2013, the order was registered in the Ministry of Justice and is published today on the website of the Ministry of Education and Science. The subject of Theology is singled out as a separate extended group to enable higher education institutions to train bachelors, masters and post-graduates. 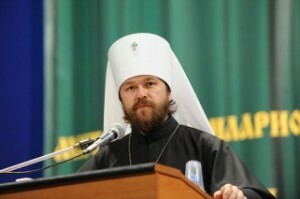 Metropolitan Hilarion of Volokolamsk in his capacity as chairman of the Russian Orthodox Church Interdepartmental Coordinating Group for Teaching Theology in Universities and rector of the Ss Cyril and Methodius Institute of Post-Graduate and Doctoral Studies, comments on the changes. – Your Eminence, at the stage of discussion on the draft list of extended chief subjects, a fairly hot discussion developed as to what place Theology can have on this list. How justified is its singling out as a separate group? – Historically, theology used to have and has an independent status of academic discipline both in Western European countries and Russia. Although interdisciplinary relations between theology and history, philosophy and philology have always been strong, academics have never challenged its academic identity. Modern theology has its own subject core which does not overlap with other humanities. – You have mentioned the historical context. Wasn’t theology in pre-revolutionary Russia outside the university education? – In the Russian Empire, there was only one theological faculty, Protestant, in the University of Tartu. But since Orthodox theology was of fundamental importance, a separate system of academies and seminaries was created for it. Moreover, theological academies and seminaries appeared here before secular universities did. For this reason, when universities began to be established, they had no departments of theology since they already existed in the form of academies and seminaries. Both university departments and theological schools made a unified education system regulated by the state as the constitutions of these schools, just as those of universities, were approved by the supreme governmental authorities. Theological academies participated in academic studies on a par with universities and the Academy of Sciences. I can cite as an example the Russian Archaeological Institute established in 1894 in Constantinople as a joint project of the Academy of Sciences and the Church. In the Soviet Union, theology was forcibly removed from the academic and educational space for purely political reasons, contrary to the opinion of the academic community. Already after the Revolution, in 1918, the Universities of Petrograd and Kazan were ready to include the theological academies, which were being closed, as their departments but the authorities did not let them do it for ideological reasons. – And what is the status of theology as a subject group in the international educational space today? – Theology as a separate extended group of subjects is described in detail in basic international classifiers. Thus, the International Standard Classification of Education (ISCED-2011) adopted by the 36th General Conference of UNESCO, clearly separates Religion and Theology from, say, Philosophy and Ethics. In the Classification of Instructional Programs (CIP 2012) of the American National Center for Education Statistics (NCES), the group of Theology and Religious Vocation is registered separately from the area of philosophy and religious studies. It includes the following major studies: Bible studies, mission studies, religious education, religious music, ministry, pastorship, pastoral counselling and special ministries. In all the major secular universities in Western Europe and America, there are departments of theology, and theology is taught as a separate academic discipline. And the teaching may be of confessional and non-confessional nature. In particular, the University of Oxford, in which I happened to study, the faculty of theology is non-confessional, but the university has as its parts colleges and academic centres which belong to the Anglican, Catholics and other Christian confessions. Metropolitan Kallistos of Diokletia, an Orthodox hierarch, taught at the faculty for over 30 years. – What is the position of other traditional religions in Russia on this matter? – The traditional religions in Russia have a unified position on this matter. The consolidated position of representatives of major religious confession in the Russian Federation was formulated in a letter sent to President Vladimir Putin in June 2013 on behalf of the Interreligious Council in Russia. This letter stressed that Theology as poly-confessional educational standard taught on the level of Bachelor’s and Master’s degrees actually is a subject meta-area which cannot but be applied to the post-graduate studies as well. – Please tell us about the major stages in the discussion concerning the definition of the status of theology in the list of chief subjects. – As soon as we were given an opportunity to formulate our position, we held a comprehensive discussion on this problem in the church milieu. This theme was put on the agenda of the Supreme Church Council in summer 2013. We received a great deal of responses from the academic community and experts of various levels. With the blessing of the Supreme Church Authority, the work was entrusted to the Russian Orthodox Church’s inter-departmental coordinating group for teaching theology in universities, established by the Holy Synod. Contributions to this work were made by the Academic-Methodological Council on Theology, the Academic-Methodological Association on Classical University Education as well as St. Tikhon’s Orthodox Humanities University. At every stage we maintained direct contacts with specialists in the Ministry of Education and Science. Initially, not all the specialists always treated our position with due understanding. Some proposed that we should set up an extended group of subjects under the general designation “Philosophy, Ethics, Religious Studies, Theology”. But we could not agree to it since theology as science is fundamentally different from the other disciplines enumerated including religious studies which represent a study of religion often from atheistic perspectives. The constructive dialogue with the Ministry of Education and Science has brought forth its fruits, and today we have a situation which enables us to develop Theology as an area in the secular education space. It is especially relevant since many universities in the country are opening chairs and departments of theology whose work appears to provoke a great interest both among students and professors. I can state this from my own experience of teaching at the Research Nuclear Institute MIFI where from 300 to 400 students attend my lectures. – What opportunities have opened up for theological education? – The fixation of the area of Theology as a separate extended group offering Bachelor’s, Master’s and post-graduate courses will make it possible to legalize the academic potential existing in Russian theology. The academic component of the educational process is extremely important, and the higher it is the higher the education cycle. A mechanism has been established to define how good is the performance shown by a theological post-graduate student in academic work. This work to return theology to the secular educational field, however, is not over. The next stage is to create conditions for the state recognition of academic degrees awarded for theses on theology, as is the case throughout the world. Among the steps towards it has been the establishment of a Church Doctoral Dissertation Council formed in accordance with requirements made to such councils in the secular academic space. We will continue dialogue on this theme with the Minister of Education and Science.